The reason for no posting last week, and a delayed start this week even though I’ve been back, was a family vacation to the Universal Orlando resort in Orlando, Florida. The primary focus of our visit was the newish Diagon Alley section of the USF park, which is magnificently done. If you or anyone in your family is a fan of the Harry Potter books and/or the movies, it is definitely a worthwhile destination. I think my daughters would like to move there. 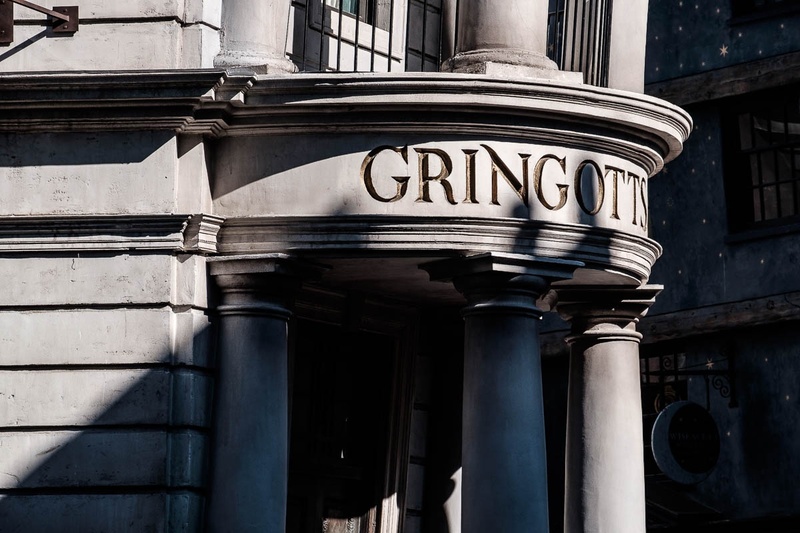 The primary feature of the Gringotts Bank building is the fire-spewing dragon perched atop it, but I thought this lower facade looked interesting, especially with the shadows. The stars on the building in the background are a feature I did not notice until I looked closely at the image on my computer.